In order to significantly reduce harmful pollution by 2040, electrification will have to form part of a comprehensive package of policies to reduce power sector carbon emissions and improve energy efficiency, the Paris-based body that advises nations on energy policy said. The clamor for global action to dramatically cut emissions has reached fever pitch in recent months following the publication of a United Nations reportthat called for annual investment of $2.4 trillion in clean energy to avoid irreversible damage to the world. A common belief is that the electrification of transport and heating systems will go a long way to meeting stringent pollution targets set out in the 2015 Paris Agreement. Since the turn of the century, carbon dioxide emissions from utilities have grown at an average of 2.3 percent a year, with coal-fired plants the biggest culprit, the IEA said. However, the rate of growth is slowing due to more electricity from booming renewable energy markets and an improvement in fossil-fuel plant efficiency. Total global carbon dioxide output rose 1 percent last year and the IEA expects that to reach a record high in 2018. The opportunity for electrification is startling. 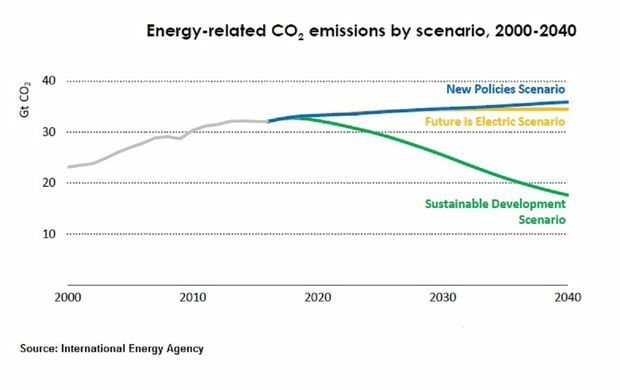 From 19 percent of total final energy consumption today, it could potentially reach 65 percent as policies to electrify mobility and heat come into force around the world. Renewable energy is playing its part with wind and solar now providing 6 percent of global electricity generation compared with 0.2 percent in 2000. Investment in the power sector hit $750 billion in 2017, higher than oil and gas investment for the second straight year, the agency said. The look and shape of the global power fleet is rapidly changing. In less than two years, more than 150 gigawatts of new coal capacity will come online. That’s less than 160 gigawatts of new wind production and 230 gigawatts of solar. Gas-fired generation will overtake coal by the middle of the next decade and solar will outstrip the dirtiest fossil fuel before 2040. About the same time, battery storage capacity will reach 220 gigawatts, equivalent to India’s total coal fleet today. Asia’s influence in world energy markets is laid bare in this year’s report. The continent makes up half of the world’s growth in natural gas use and 60 percent of the increase in wind and solar capacity. It will also account for all of the growth in coal and nuclear, given the fuels’ declining use in other parts of the world. Chinese-owned power companies now account for more than one-eighth of global installed capacity, with six of the leading 10 utilities hailing from the Asian nation. In 2003, there were no Chinese companies in the top 15, according to the IEA.